Following the announcement of the fight, jnr hit back at fans on social media who claimed the IBO belt isn't a 'real world title', "That title has been held by some of the greatest champions in recent boxing history and it’s currently held by Gennady Golovkin, at middleweight. You can’t tell me anything, it’s a legitimate world title." He also stated his move to super-middleweight was not permanent. He saw an opportunity for fight for a world title and took it. If he can win the world title, then he will negotiate with other champions. Despite not previously fought at super-middleweight, the December ranking update has Eubank at number seven, previously being number two at middleweight. 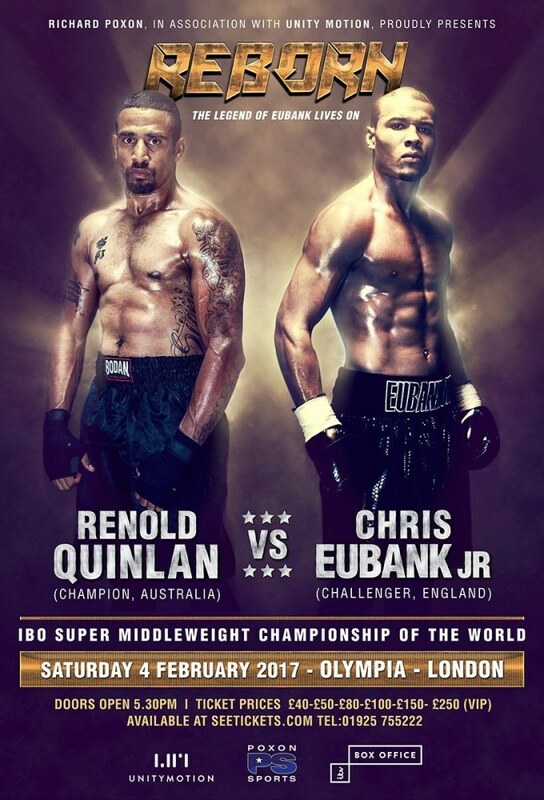 On 6 January 2017, Quinlan threatened to walk away from the fight. The reason being there was little to no promotion, with the fight being only weeks away. he stated the build up has not been enough to promote the biggest fight of his career, "It’s only a few weeks away and I've got the feeling that it’s going to be delayed. There’s been no media around it and it’s not getting the exposure it should be. I've been training well but I’m not 100 per cent focused now. I have a feeling it's going to get pulled."